Lutsk – The naming of the international Lviv airport in honor of the founder of the city, King Daniel of Galicia (aka Danylo Halytsky), was the event that suggested a flashback to history, to remember the origins of Prince Danylo. The omniscient Wikipedia says that Danylo was the Great Prince of Kyiv, Prince of Galicia, and Prince of Volhynia – and historians know the same. Moreover, his rule of Galicia and Volhynia coincided in time. Historian Petro Tronevych, an expert on local history and author of a monograph and a number of books on the early history of Lutsk, maintains that the name “Danylo Halytsky” is conventional and thus it is hardly worthwhile changing it. But he remarks that the name Halytsky (of Galicia) is anything but surname (there were no surnames in the 13th century). It rather indicates the prince’s area of activity. Danylo is known to have accessed to the throne as early as at four, after the death of his father, great-grandson to Volodymyr (Vladimir) Monomakh and descendant of the Rurikids, Roman Mstyslavovych (Mstyslavich). Therefore in 1199 he succeeded in uniting the lands of Volhynia and Galicia into one state. However, Roman’s sons, Danylo and Vasylko, had to spend 40 years to reassemble these lands anew, following their division due to the boyar feud and foreign intervention. The Ukrainian historian Hryhorii Hurtovy, founder and head of the popular historical museum in a little town of Torchyn, Volyn oblast, professor honoris causa at the Lesia Ukrainka Volyn National University, says that the museum exposition even includes a picture of the coat-of-arms of Volodymyr-Galicia Principality (contrary to the conventional name “the Principality of Galicia-Volhynia,” or the more recent “Principality of Volhynia-Galicia”). That’s only natural, since one of the capitals was Volodymyr in Volhynia, and the other, Galych [which gave its name to Galicia. – Ed.]. The first city was the seat of Prince Vasylko, while Danylo ruled over the other, but both principalities existed as a unity under the seniority of the older and more active Danylo. Hurtovy says that Danylo has something more to do with Volhynia and Volodymyr than his lineage: he is the “nestling of the Volhynian nest,” son of the Prince of Volhynia and Volodymyr. And, by the way, one of the surviving ancient temples in Volodymyr is still called Mstyslav’s Church, named so after its builder, Danylo’s grandfather, Prince Mstyslav Iziaslavovych. According to Hurtovy, Prince Danylo might just as well be titled Danylo of Kholm, because he eventually moved the capital to the newly-founded city of Kholm (now Chelm in Poland), where he died and was buried. “Thus, naming the Lviv airport in honor of King Danylo is not in the least contrary to historical truth,” says Hurtovy. “Lviv was founded by Danylo in honor of his son Lev. Danylo was a statesman, who united Ukrainian lands, and the commemoration of his name is quite a natural thing, a cause of honor for every Ukrainian. Meanwhile we, Volhynians, must also remember his relations with Prince Vasylko of Volodymyr, which were a paragon of brotherly cooperation for the good of the state. Almost at the same time with the naming of the Lviv Airport after Prince Danylo, an attempt to restore yet another historical justice was made in Lutsk, where Tronevych presented his book Velyky kniaz Dmytrii-Liubart i yoho suchasnyky (Great Prince Dmytrii-Liubart and His Contemporaries). He was motivated to write it by Lithuanian scholars who visited Lutsk a few years before and in their reports used phrases like “Liubart, the Lithuanian Prince” or “Liubart Castle was built by Lithuanians.” Luchesk [the ancient name of Lutsk. – Ed.] itself was indeed a winter residence of the great princes of Lithuania at some point of time. But Tronevych, who has written a monograph Lutsky zamok (The Castle of Lutsk) and is an expert on that epoch, says that Liubart, son of Grand Duke of Lithuania Gedymin (Gediminas), was of Rus’ origin on the maternal side (Rusyn was a contemporary ethnonym used to denote Ukrainians). He was baptized Dmytrii, and a marriage with a princess from Lutsk made him a prince of Lutsk. 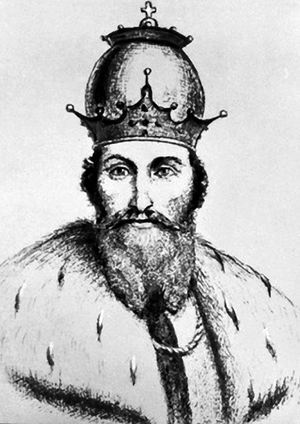 Later he was elected to take the throne of Volodymyr and Galicia. Modern Luchesk was the last capital of the Principality of Volodymyr and Galicia. Dmytrii-Liubart used the money from state treasury to build a castle whose correct name should be the Lutsk Castle, yet the grateful descendants keep calling it Liubart’s Castle.